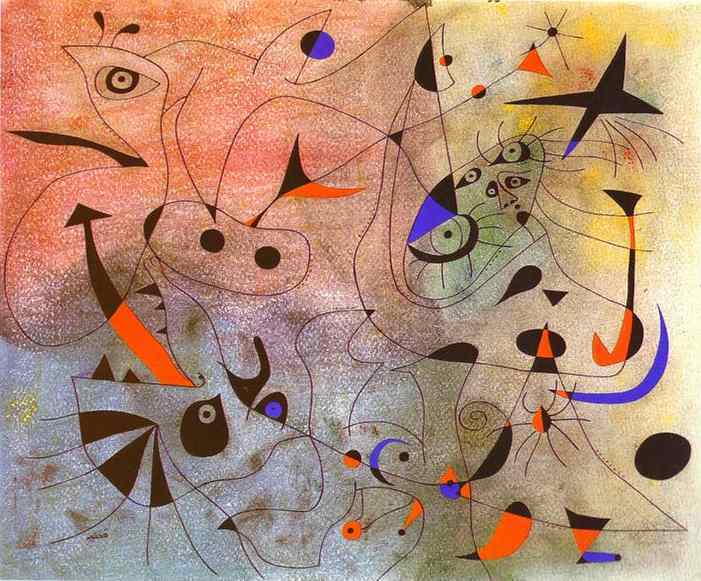 Today is the birthday of Joan Miró i Ferrà, extraordinarily revolutionary Catalan painter, sculptor, and ceramicist. A museum dedicated to his work, the Fundació Joan Miró, was established in his native city of Barcelona in 1975, and another, the Fundació Pilar i Joan Miró, was established in his adoptive city of Palma de Mallorca in 1981. His work has been interpreted as Surrealism, a sandbox for the subconscious mind, a re-creation of the childlike, and a manifestation of Catalan pride. It is all and none of these. In numerous interviews dating from the 1930s onwards, Miró expressed contempt for conventional painting methods as a way of supporting bourgeois society, and famously declared he desired an “assassination of painting” in favor of upsetting the visual qualities of established painting. Miró was born into the families of a goldsmith and a watchmaker and grew up in the Barri Gòtic neighborhood of Barcelona. His father was Miquel Miró Adzerias and his mother was Dolors Ferrà. He began drawing classes at the age of seven at a private school at Carrer del Regomir 13, a medieval mansion. In 1907 he enrolled at the fine art academy at La Llotja, to the dismay of his father. He studied at the Cercle Artístic de Sant Lluc and he had his first solo show in 1918 at the Dalmau Gallery, where his work was ridiculed and defaced. Miró was drawn towards the arts community that was gathering in Montparnasse and in 1920 moved to Paris, but continued to spend his summers in Catalonia. 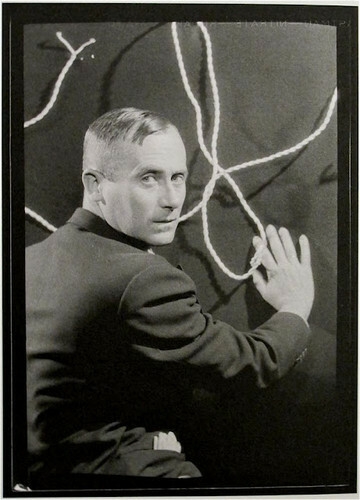 Miró initially went to business school as well as art school. He began his working career when he was a teenager as a clerk, although he abandoned the business world completely for art after suffering a breakdown. His early art, like that of the similarly influenced Fauves and Cubists exhibited in Barcelona, was inspired by Vincent van Gogh and Paul Cézanne. The resemblance of Miró’s work to that of the intermediate generation of the avant-garde has led scholars to call this time his Catalan Fauvist period. 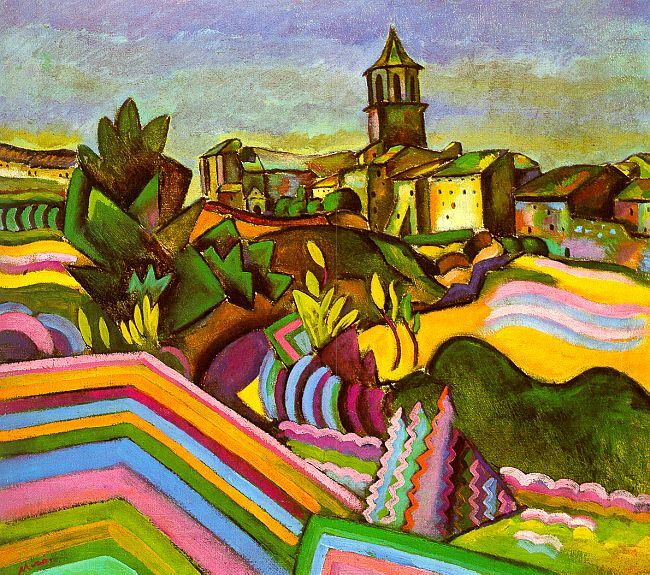 A few years after Miró’s 1918 Barcelona solo exhibition, he settled in Paris where he finished a number of paintings that he had begun on his parents’ summer home and farm in Mont-roig del Camp. One such painting, The Farm, showed a transition to a more individual style of painting and certain nationalistic qualities. Ernest Hemingway, who later bought the piece, compared the artistic accomplishment to James Joyce’s Ulysses and described it by saying, “It has in it all that you feel about Spain when you are there and all that you feel when you are away and cannot go there. No one else has been able to paint these two very opposing things.” Miró annually returned to Mont-roig and developed a symbolism and nationalism that would stick with him throughout his career. 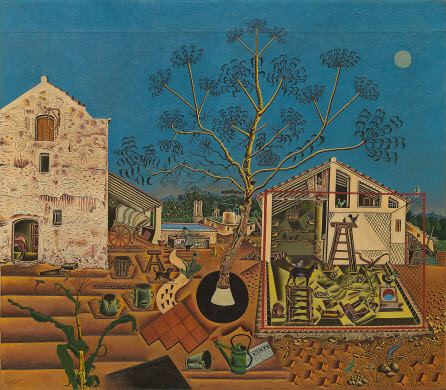 Catalan Landscape (The Hunter) and Tilled Field, two of Miró’s first works classified as Surrealist, employ the symbolic style that was to dominate the art of the next decade. Miró did not completely abandon subject matter. Despite the Surrealist automatic techniques that he employed extensively in the 1920s, sketches show that his work was often the result of a methodical process. Miró’s work rarely dipped into non-objectivity, maintaining a symbolic, schematic style. This was perhaps most prominent in the repeated Head of a Catalan Peasant series of 1924 to 1925. In 1926, he collaborated with Max Ernst on designs for ballet impresario Sergei Diaghilev. With Miró’s help, Ernst pioneered the technique of grattage, in which he troweled pigment onto his canvases. Miró returned to a more representational form of painting with The Dutch Interiors of 1928. Crafted after works by Hendrik Martenszoon Sorgh and Jan Steen seen as postcard reproductions, the paintings reveal the influence of a trip to Holland taken by the artist. These paintings share more in common with Tilled Field or Harlequin’s Carnival than with the minimalistic dream paintings produced a few years earlier. 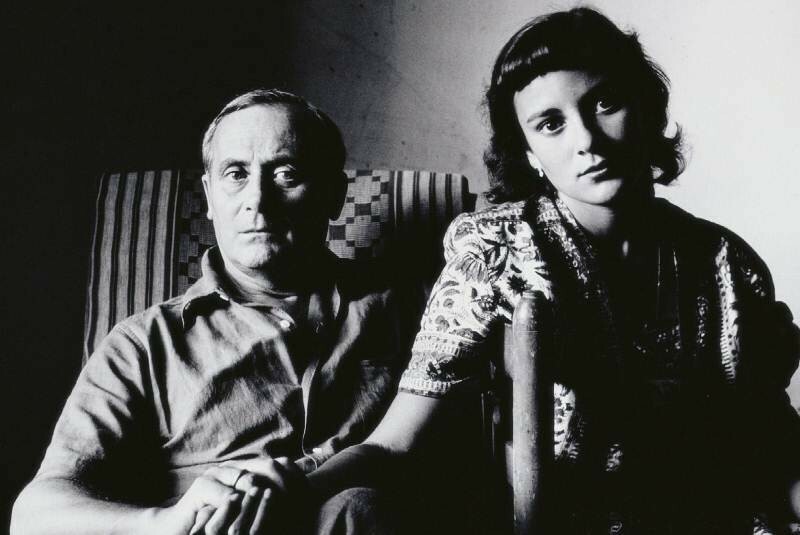 Miró married Pilar Juncosa in Palma (Majorca) on 12 October 1929; their daughter Dolors was born 17 July 1931. In 1931, Pierre Matisse opened an art gallery in New York City. The Pierre Matisse Gallery (which existed until Matisse’s death in 1989) became an influential part of the Modern art movement in the U.S. From the outset Matisse represented Joan Miró and introduced his work to the United States market by frequently exhibiting Miró’s work in New York. 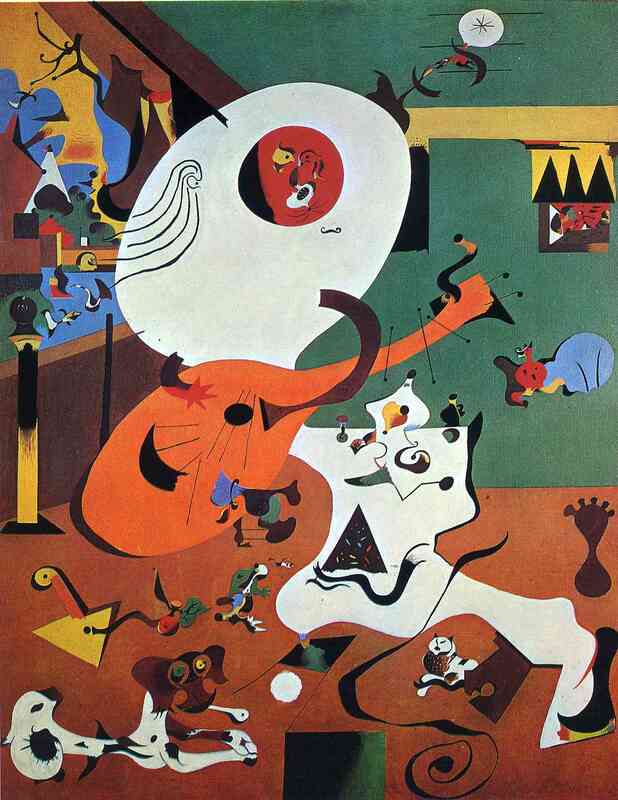 Until the outbreak of the Spanish Civil War, Miró habitually returned to Spain in the summers. Once the war began, he was unable to return home. Unlike many of his surrealist contemporaries, Miró had previously preferred to stay away from explicitly political commentary in his work. 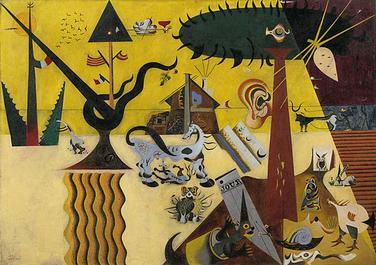 Though a sense of (Catalan) nationalism pervaded his earliest surreal landscapes and Head of a Catalan Peasant, it wasn’t until Spain’s Republican government commissioned him to paint the mural, The Reaper, for the Spanish Republican Pavilion at the 1937 Paris Exhibition, that Miró’s work took on a politically charged meaning. In 1939, with Germany’s invasion of France looming, Miró relocated to Varengeville in Normandy, and on 20 May of the following year, as Germans invaded Paris, he narrowly escaped to Spain (at the time controlled by Francisco Franco) for the duration of the Vichy Regime’s rule. In Varengeville, Palma, and Mont-roig, between 1940 and 1941, Miró created the twenty-three gouache series, Constellations. 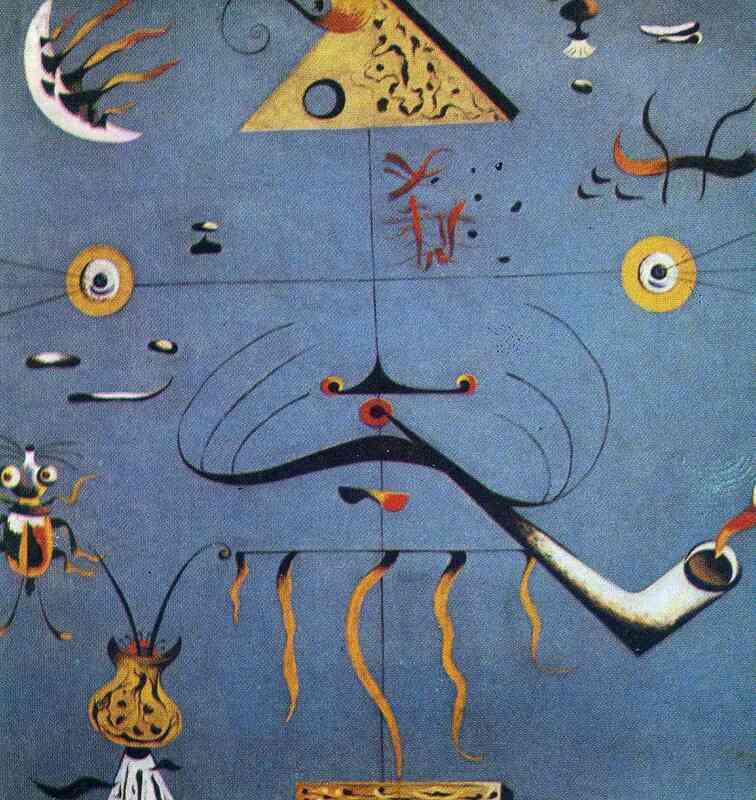 Revolving around celestial symbolism, Constellations earned the artist praise from André Breton, who seventeen years later wrote a series of poems, named after and inspired by Miró’s series. Features of this work revealed a shifting focus to the subjects of women, birds, and the moon, which would dominate his iconography for much of the rest of his career. In 1959, André Breton asked Miró to represent Spain in The Homage to Surrealism exhibition alongside Enrique Tábara, Salvador Dalí, and Eugenio Granell. Miró created a series of sculptures and ceramics for the garden of the Maeght Foundation in Saint-Paul-de-Vence, France, which was completed in 1964. In 1974, Miró created a tapestry for the World Trade Center in New York City together with the Catalan artist Josep Royo. He had initially refused to do a tapestry, then he learned the craft from Royo and the two artists produced several works together. His World Trade Center Tapestry was displayed for many years at the World Trade Center building. It was one of many works of art lost during the September 11 attacks. 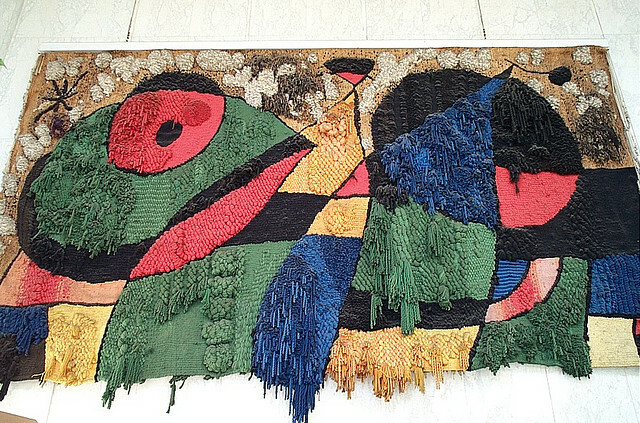 In 1977, Miró and Royo finished a tapestry to be exhibited in the National Gallery in Washington, USA. 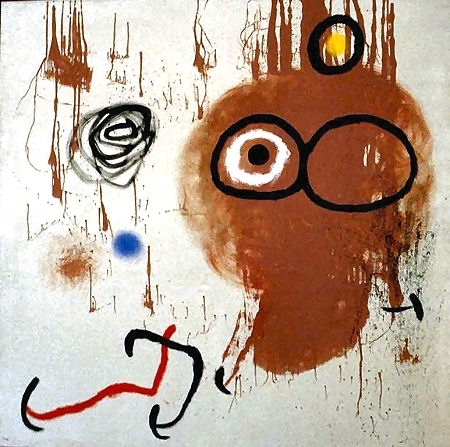 In 1981, Miró’s The Sun, the Moon and One Star—later renamed Miró’s Chicago—was unveiled. This large, mixed media sculpture is situated outdoors in the downtown Loop area of Chicago, across the street from another large public sculpture, the Chicago Picasso. Miró had created a bronze model of The Sun, the Moon and One Star in 1967. The maquette now resides in the Milwaukee Art Museum. 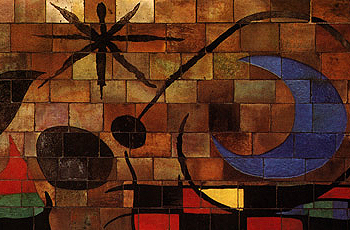 In the final decades of his life Miró worked at a rapid pace in different media, producing hundreds of ceramics, including the Wall of the Moon and Wall of the Sun at the UNESCO building in Paris. He also made temporary window paintings (on glass) for an exhibit. In the last years of his life Miró wrote his most radical and least known ideas, exploring the possibilities of gas sculpture and four-dimensional painting. In 1979 Miró received a doctorate honoris causa from the University of Barcelona. On Christmas day 1983 he suffered a heart attack and died in his home in Palma (Majorca). 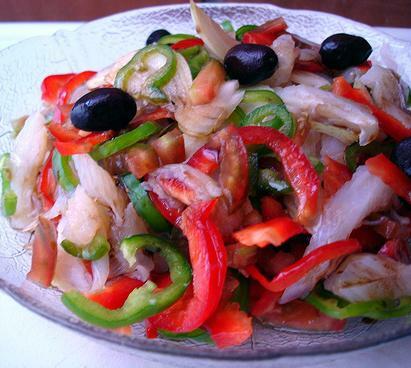 Esqueixada de bacalao (salt cod salad) is a classic Catalan dish suitable for celebrating Miró. There are recipes available, but you have a wide variety of choices of ingredients, so I will give you the outline and leave you to decide. Salt cod and black olives are the only things you cannot dispense with. Salt cod needs to be desalinated before using it. Put 100 grams per person in a large non-reactive container of cold water and refrigerate for three days, changing the water often. Drain the cod and shred it. Then in a large bowl add black olives plus your choice of chopped tomatoes, sliced onion, bell pepper, and hard boiled eggs . . . or whatever you fancy. Dress with extra virgin olive oil and vinegar (or lemon juice) and refrigerate for several hours. Serve on chilled plates. Esqueixada can also be served — chopped finely — on warm garlic toast. In posts on artists I usually try to give an idea of how an artist reached the “typical” style we all recognize instantly. In Miró’s case that is only minimally possible. Sure, we can look at Constellations and know it is him. But he was not just prolific, he was continually evolving new concepts up until he died.